Telangana – the latest State to have born is in news….. the State comprises of areas of the princely state of Hyderabad (Medak and Warangal Divisions)ruled by the Nizams. There has been marked exodus reaching peak in the week-end as hundreds of Telangana residents living and working in Chennai, parts of Tamil Nadu as also other States headed home. They plan to be in their homes in various parts of the newly-formed state ahead of the August 19 Intensive Household Survey (IHS), planned by the Telangana government to create an accurate database for effective implementation of government welfare schemes. Charminar Express, which left Chennai Central was packed with several passengers racing to be there. The Telangana Government has declared a general holiday for all the government offices, educational institutions and banks under the Negotiable Instruments Act on August 19. The holiday day has been declared to facilitate smooth conduct of the Intensive Household Survey that day. One version of the survey form uploaded on the website of the TRS mouthpiece Namaste Telangana contains questions on the state one hails from, native language and how long a person has lived in Telangana. Versions uploaded elsewhere do not contain some of them. In India, General elections are festivities, and the proposed survey is bound to be another as it would cover about 84 lakh families ………. Telangana is expected to come to a standstill on August 19 - the Survey will result in buses and autorickshaws going off the roads, Mee Seva and other citizen service centres downing shutters and petrol bunks remaining shut on August 19. Hospitals will operate emergency services. About 4 lakh employees including policemen and teachers would take part in the one-day exercise. Chief Minister K Chandrasekhar Rao, who assumed office on June 2, has expressed hope that the outcome of the survey would help the government plan better for welfare. It has also led to allegations that its hidden agenda is to target natives of Seemandhra. Some media reports suggested that failure to participate would make people ineligible for government schemes in future. In case of weddings, death in the family or hospitalisation, citizens can call the enumerator (whose number will be given during the pre-survey) to complete the inspection on a priority basis. The proposal has caused panic among denizens of the state working outside the state rushing back home to participate in it. The out of state workers fear that if they fail to stand up and counted in the survey they will cease to be 'citizens' of Telangana and will lose their property and other rights in the state. The Telangana government on Thursday informed the Hyderabad High Court that the proposed Intensive Household survey on August 19 was a voluntary one and there was no element of compulsion. The judge recorded this undertaking and declared that the court was not inclined to stay the survey. The Govt has told the Court that the information given by the citizens including the petitioners would be available in public domain and the Govt was seeking to utilise the said information for “weeding out” beneficiaries who are not entitled to various welfare schemes of the State. To some, the survey is tantamount to low-intensity targeting and singling out people from one particular state. The Hyderabad high court permitted the Telangana government to go ahead with the household survey on the assurance of the state's advocate general that the exercise was not mandatory and denizens could choose not to answer the queries of enumerators. 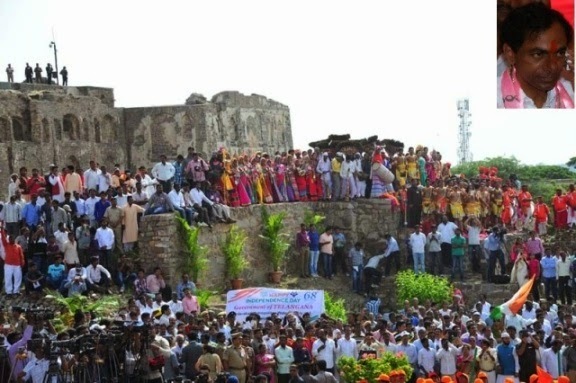 On the Independence Day, the first for the State, colourful celebrations were held inside the historic Golconda fort where the Chief Minister K. Chandrasekhar Rao hoisted the flag and launched a tirade against "evil forces" for spreading a disinformation campaign about the intensive household survey in the State on Tuesday. The Kakatiya dynasty, that ruled from Warangal from AD 1083-1323, seems to be in the spotlight post bifurcation. The Golconda fort, where Independence Day was celebrated for the first time in Telangana state, was constructed by the Kakatiya rulers.